There is no doubt that in order to be effective at their jobs, pickup trucks need to be tough and durable. On the other hand, modern pickup trucks also need to provide for vehicle occupant safety, connectivity, and comfort. The RAM 2500 full-size pickup truck scores high marks in all of these areas. An example of these trip enhancing features include easy to use command and control systems, comfortable seating arrangements, and even cleverly added additional storage space. RAM 2500 drivers and passengers can enjoy and benefit from a generously sized 8.4-inch touch capable screen that supports technologies such as Android Auto, Apple CarPlay, and even SiriusXM radio. The RAM 2500 may be made to work, but it still offers occupants the comfort and convenience of vinyl seating. Vinyl seats resist stains and damage and make cleanups pain free. 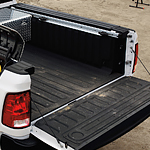 The RAM 2500 is a crew cab vehicle that includes plenty of storage in the rear bed. That said, this vehicle also comes fully equipped with specialized storage space under the rear seat that allows for occupants to bring luggage, extra tools, or anything else they may need during their travels.